Skanska has signed a contract with Växjö Fastighetsförvaltning AB to build Växjö City Hall and Central Station in Växjö, Sweden. The contract is worth about SEK 580M, which will be included in the Nordic order bookings for the fourth quarter 2017. 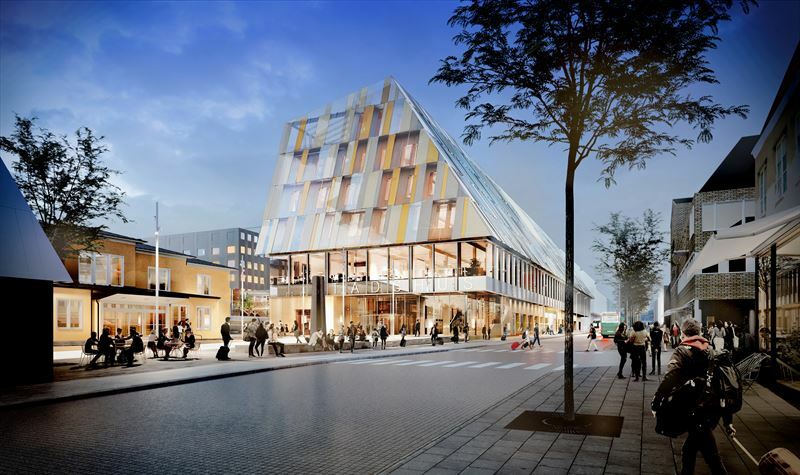 Växjö City Hall and Central Station will be seven floors high, including basement, and comprises about 16,400 square meters in total. The new 13,700 square meter city hall will be a workplace for about 600 people and will contain a number of common areas. The station building of 1,850 square meters on the ground floor will include a waiting room, shops and restaurants. In addition, a public space of about 800 square meters, called "Växjö’s living room" is created, a social focal point indoors which, together with existing walking and cycling bridges, will connect the neighborhoods in the city center. The building is largely characterized by wood and glass. The intention is that it should be environmentally certified according to Miljöbyggnad Gold. Miljöbyggnad is a Swedish environmental certification system owned by Sweden Green Building Council. Preparatory work for construction will commence in spring 2018 and the building will be completed by the end of 2020/2021.